Posted on Tue, Jan 24, 2012 : 11:11 a.m. It's National Peanut Butter Day, which is different than National Peanut Butter Lovers' Day and National Peanut Butter Cookie Day. Don't worry — there's enough love for peanut butter to cover every one of these celebrations! Today I'm offering a luscious, creamy pudding to show case the fabulous flavor of the star ingredient. And who could go wrong by adding a bit of chocolate as a garnish? Especially when the chocolate comes in the form of Reese's peanut butter cups! Whether you enjoy this rich dessert, an Elvis peanut butter and banana sandwich, some Asian noodles in peanut sauce, or some other dish, just be sure not to miss the party today! In a 1-quart saucepan, combine cornstarch, brown sugar, salt and water; cook over high heat, stirring constantly, until it becomes translucent and gelatinous. Lower heat to medium. Slowly whisk in the half-and-half. Stir in egg and vanilla and cook until thickened, stirring constantly. Remove from heat and stir in peanut butter. Divide the pudding among 4 small dessert cups, then cover with plastic wrap. Let cool completely in the refrigerator. 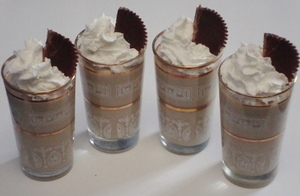 To serve, top with whipped cream and garnish each with half of a peanut butter cup. Wed, Jan 25, 2012 : 3:08 p.m.
Is Koeze pb okay to use? Wed, Jan 25, 2012 : 4:26 p.m.
Tue, Jan 24, 2012 : 4:59 p.m.
Peanut Butter day? It looks like I need to include the dog in on this and give her a heaping helping pasted to the roof of her mouth. Keeps her busy for a few minutes and always brings a smile to my face. Thu, Jan 26, 2012 : 3:08 p.m.
Wow, I never thought I would say this to Jessica but here goes: &quot;And now I wanna' be your dog&quot;! Tue, Jan 24, 2012 : 7:08 p.m.
Yeah, freezing slows the whole process down, making the kong last a little longer. We've got one of those really big ones, and I stuff it full of peanut butter and kibble. Tue, Jan 24, 2012 : 6:02 p.m.
Oh we do the Kong thing, but if it is a holiday then instant gratification is warranted. Interesting about freezing it, we have never tried that. Tue, Jan 24, 2012 : 5:20 p.m.
Tue, Jan 24, 2012 : 5:14 p.m.
Tue, Jan 24, 2012 : 4:25 p.m.
Tue, Jan 24, 2012 : 4:29 p.m. I love peanut butter ice cream! Just thinking of it makes me want to rush out and buy some! Tue, Jan 24, 2012 : 1:33 p.m. This sounds delicious; my kids love peanut butter. We had peanut butter pancakes with nutella sauce (your recipe from last summer, which we love) for breakfast. Who knew there was a National PB Day? Keep the PB recipes coming, Mary. Tue, Jan 24, 2012 : 2:59 p.m.